One of the aspects of buying a specific product online or offline is to consider that product's support lifecycle. The support lifecycle in plain terms refers to the time the developer or manufacturer of the product supports it with updates and staff to help users in support related tasks. It is on the other hand not as if the product will stop working from one day to the other. The core issue here is that updates, and most importantly security updates, will no longer be produced for the product once the product reaches the end of its lifecycle. While that's a big issue for Microsoft operating systems, it often does not really affect other Microsoft products such as Office. I know a few people who are still running Microsoft Office 2000 because that's all they need, and support for that product ended in 2009. With Microsoft, it is more complicated than just looking at your product's lifecycle on the official website. The core reason here is that Microsoft may make distinctions not only depending on the country your purchased your product in but also on the edition of the product that you bought. You probably want to know about the differences between mainstream and extended support phases? Mainstream Support is the first phase of the product support lifecycle. Extended Support: Security updates, paid support. A third phase is often mentioned by Microsoft, the "Self-Help Online Support phase which allows free access to Knowledge Base articles, online product information and online support webcasts. Organizations may pay Microsoft to extend support beyond the official lifecycle. 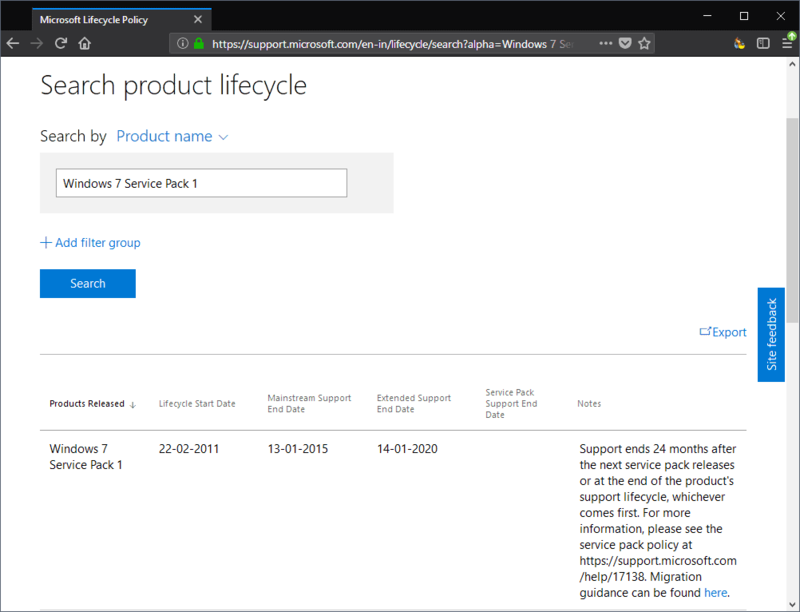 When it comes to service packs Microsoft usually offers a 24 month support lifecycle. End of general product support will always end support for all the product's service packs. Microsoft stopped the production of service packs with the release of Windows 8. The company switched to a Windows as a Service model with the release of Windows 10. Windows as a Service sees continued feature update releases for the operating system. Now that you know about the support lifecycles, it is time to show you how to find the information for products that you have already purchased or plan to purchase. Visit the Microsoft Support Lifecycle search page and type the name of the product that you are interested in. Microsoft displays suggestions so that you may use those to pick the right product. Matching products are listed with their name and information such as the lifecycle start date, end of mainstream and extended support, information about service packs if available, and notes. The notes may list migration information links that detail whether it is possible to upgrade the operating system to a newer version of Windows. How long is your Microsoft product supported by the company, and what is the difference between mainstream support and extended support?